If you really want to be efficient purchase another head for quick field replacement. Use approximately 12 feet of 0.095 string. Line up arrow on case cover with string hole.This aligns the holes so the string can be pushed through. Push the string through and pull until the ends are same length. To insure the strings are in an upper and lower channel do the following. Rotate the mechanism one half turn CW and pull the strings tight. Repeat about three times. This means the strings have wound about two turns correctly in the upper and lower channel and are not crossed. Rotate the mechanism until the strings stick out the holes about 15 cm. 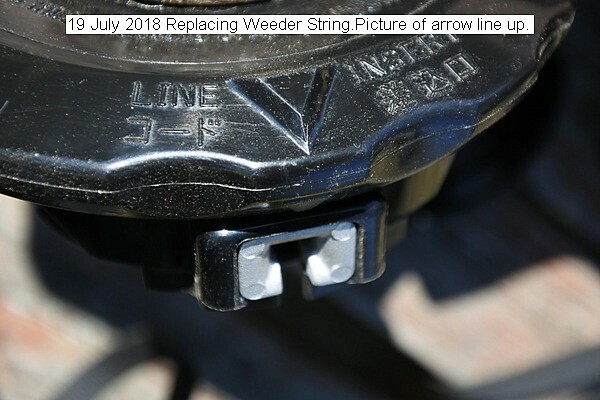 This entry was posted in Uncategorized and tagged 19 July 2018 String Replacement (Maruyama), String Replacement (Maruyama). Bookmark the permalink.